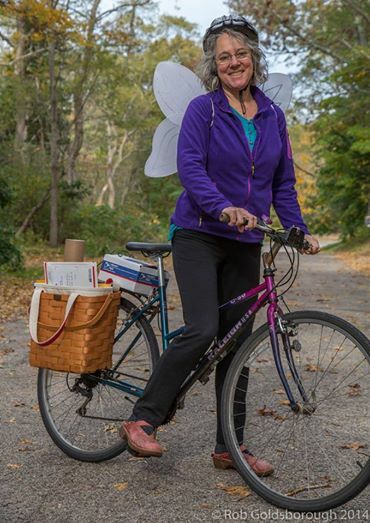 I’m a bike powered business! Enter ETSY Shop here. I am pleased to offer a selection of autographed children’s books and how-to books, posters, prints, note cards, playing cards and fairy making supplies. Please note: Blossom Fairy Kits have been discontinued. Credit cards, Paypal, SOFORT (The Netherlands) and iDEAL (Germany and Austria) are accepted. NEW ITEM – Felt Wee Folk Playing Cards! 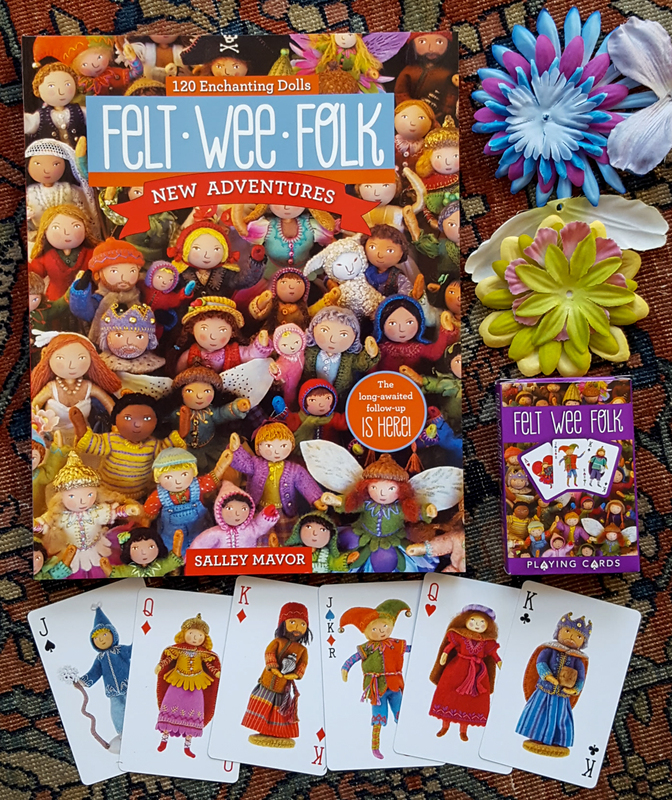 Get a free pack of playing cards with the purchase of the how-to book, Felt Wee Folk – New Adventures. What a fantastic hobby this is amazing. This takes a lot of patience to do I’m sure. You must have very nimble fingers Sally. These are just fantastic. I found your beautiful website while gathering info for my colleagues that have picked you for their author/illustrator to feature in their classroom during The Week of the Young Child. All I needed to do was show them one little board book (Wee Willie Winkie) and they were hooked ! I’m so excited that the children and families at the center I work at will be nurtured and filled with wonder by seeing your incredible artwork. Outstanding handwork! I love to embroider, haven’t done much of it lately but want to start again. Have made a few quilted pieces but sewing & creating like you would be a dream. So happy to have seen your work…what a talent. Do you still sell kits? Thanks for asking about the kits, Lily. After a good run, I stopped making them in 2005. I hope that you enjoyed making the kit, April. I sell copies of Felt Wee Folk in my Etsy Shop. The revised edition, Felt Wee Folk: New Adventures will be released in the spring of 2015. I thoroughly enjoyed the article in this the March edition of Needle Arts. I ordered a kit years ago- and was hoping you still carried them! I did give your Pocket of Posies to a dear friend’s granddaughter. Needless to say, both continue to love reading it together! So happy to see you still creating such wonderfully creative works of art to inspire! I love your books. I am currently working on making your little dolls. I love the way you have made hands with fingers. Will your revised book show how to make the hands with fingers? Are you using wire for the fingers? Thanks for writing, Mary and I’m glad that you are enjoying making the dolls. I decided not to show how to make the hands and fingers in the revised edition of Felt Wee Folk, as I consider that process proprietary and part of my personal artistic expression. The book will have plenty of other new ideas, just not the hands. Hi Salley. Just bought your new book. Love it of course. My grand daughter and I are busy making fairies, etc. Hers turn out better than mine. LOL However, really wanted to make a Santa and maybe an elf for Christmas. I know it’s early, but as you know life gets in the way of our fun. Do you sell a pattern or can you give me some ideas how to make a Santa from the patterns in your new book? I’m glad that you and your grand daughter are busy making dolls, Christine. I don’t have a Santa pattern, but you could adapt other clothing patterns by making them red and adding a belt. You could also glue on a white felt beard. I just discovered your work! It is magical. I have made 3 fairies and 4 babies in milkweed pods. I feel as if I am stealing your ideas. Where should I mail the royalty checks? Lol. Thanks for the generous gift of sharing your ideas. I’m a Chinese. I saw your products from the magazine Little Thing and was very impressed by their bright colours and vivid images. They are so amazing! The style is exactly what I’ve been looking for for such a long time. I searched in the shop for your handcrafted products but only found cards and prints. Do you mind to inform whether you sell the real embroidered products? Thanks. Wish you a nice year ahead! Thankyou Sally for your wonderful contribut ion to the Arts. Just discovered your beautiful work. Everything delayed as a result this morning, including breakfast. So inspirational! Kerrie Johnson Tasmania. Do you have a pattern for the felt chicken? Thank you for your interest in my work, Joan. I do not sell patterns for anything other than what is in my how-to book of doll projects, Felt Wee Folk.